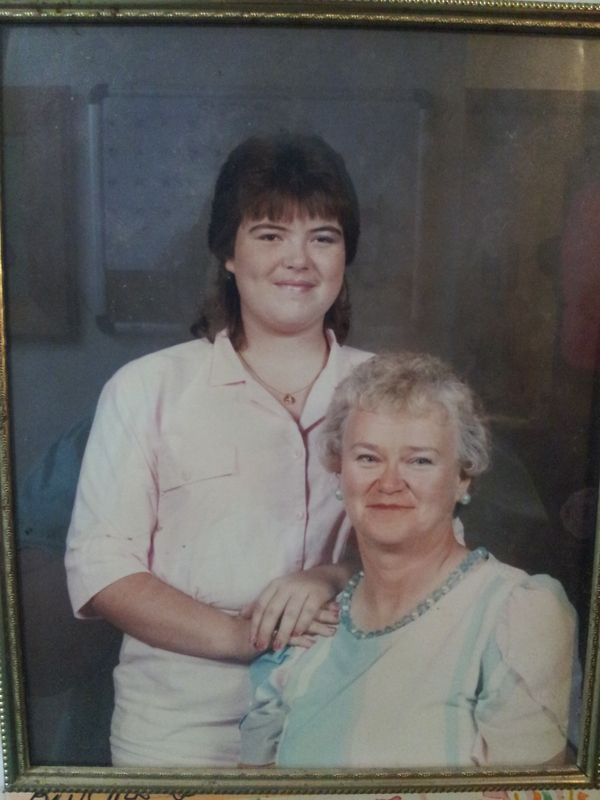 I was 14 and totally rockin’ the mullet! That’s my mom and I. I was 14 years old. It was about a year after my dad died. We were still having lots of struggles in our relationship. When Dad was alive he was the calming influence between us. I’ve mentioned before that I was totally a daddy’s girl. When he died there was no longer anyone there to calm things down between us. We had lots and lots of struggles. I’m sorry Mom! I get it now! I am the youngest of 5. My oldest sister has kids older than me. The next to the youngest was 12 when I was born. I was basically like a second family for my parents and when I was younger it was almost like being an only child. Well, until my sister and my niece moved in with us. My niece is 6 months (and 4 days!) older than me and we fought like sisters. We lived in a 2 story house and she and I shared a bedroom upstairs. We were always falling down the stairs. One particular morning we were both coming down for breakfast and each had a glass of water in hand. She went first and fell and didn’t spill a drop. I wasn’t so lucky. By the time I hit the bottom my glass was empty and I was soaked. One year I got a Slinky for Christmas. We were trying to get it to work like the commercials said it did when Mom/Grandma decided to come show us. Mom became a human Slinky. 😦 Of course at the time we thought it was super funny because we did it all the time. Now that I’m about the age she was when that happened, I’m so very sorry we laughed. I’ve fallen down a couple of stairs recently and it’s not funny anymore. Shortly before we moved from my little hometown to the county where I currently live, Mom had surgery. It was a huge change for all of us and Mom couldn’t do much at all. When we got here she was stuck in bed for weeks. Not the easiest way to start our new life but she did what she had to do and we all survived. When my dad died we were all thrown into grief, heartache and chaos. I can’t imagine how difficult things were for her. She showed amazing amounts of strength and kept our family together during the most difficult time of our lives. During my teenage years we had daily struggles. Now that I have teenagers myself, I don’t think I can ever apologize enough to my amazing mother. I love you mom! I moved out when I was 19 and now that I have a 19-year-old myself, I understand how scared my mom must have been for me. But she always let me know that she loved me and was there for me even if she didn’t agree with my choices. I learned a lot from her. 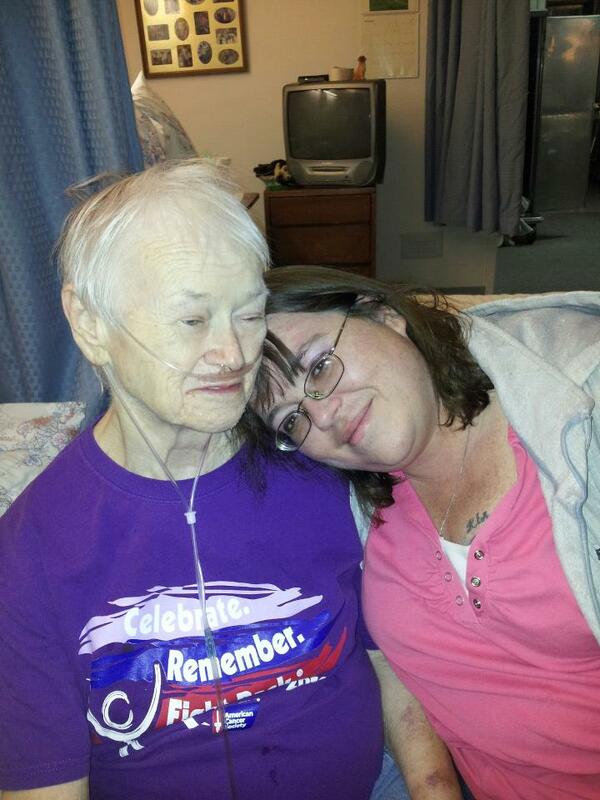 Now that Mom is older and her health is failing, I realize how grateful I am to still have her in my life. We may not always agree on things but I know that she loves me unconditionally and I am so glad God chose her to be my mom. I love you Mom and I hope your day is amazing!